Today at Sabkhat Al Fasl (Jubail) Phil Roberts and myself saw two Egyptian Nightjars roosting on a sandy bank next to the reed beds. 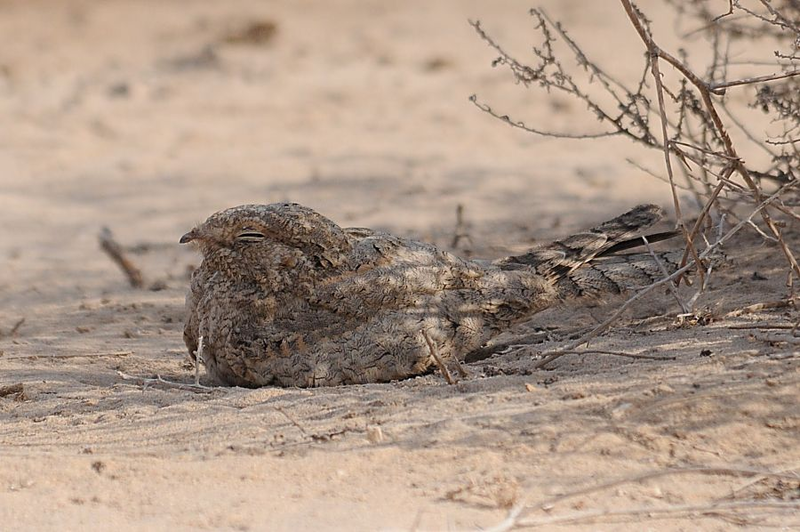 Phil has been to Sabkhat Al Fasl many times and mentioned before we went that it was a good place to see Egyptian Nightjar, which is a scarce bird in the Eastern Province of Saudi Arabia. Birds of the Eastern Province of Saudi Arabia by Bundy, Connor & Harrison 1989 has only six records of the species, but Phil has seen them regularly on migration at Sabkhat normally in August and almost always along the same bank as our sightings. I also saw one in the winter of 2011 (February and March) in Dhahran Camp hawking insects at night. Egyptian Nightjar is a passage migrant to Saudi Arabia, with the birds occurring here probably breeding in Central Asia, although their range extends from Western Europe across to Far Eastern Russia, Mongolia and China. The nominate race which occurs in Saudi Arabia aegyptius is migratory in much of range, and leaves its breeding grounds by September and migrates on broad front, SE across the Arabian Peninsula (September - November). Small numbers overwinter in Arabia, but their main wintering range is in E Sahelian zone of Africa. Return movements occur from late February to early June (mainly mid-March to mid-May). The species is not as scarce as once thought in Saudi Arabia but these birds are very early compared to other sightings seen at Sabkhat as well as other Arabian country records where sightings are generally not noted until September. These two birds are interesting records as it is very early for a returning migrants and very late for a migrant moving from its wintering grounds to breeding areas. Phil has checked this site at Sabkhat throughout the last six summers and not seen birds there in July before so these birds are presumably early migrants and the fact that they leave their breedingounds in September may need to be reviewed.